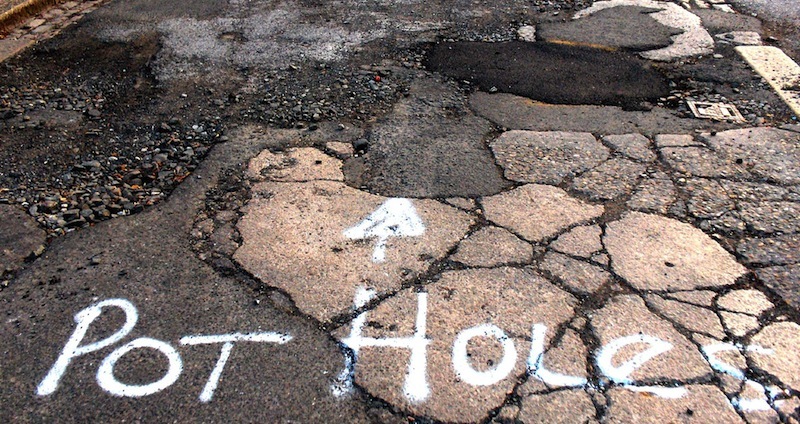 If you grew up in Lebanon like I did, you'd consider potholes an unavoidable fact of hitting the road. Any road. You start planning your driving and lanes based on the placement of potholes, until you get surprised by a new one that just sprung up out of nowhere in the last 24 hours. Sometimes you have to take the wrong side of the street to escape one, other times the pothole is so huge you can't find any way to drive around it. And your car suffers the consequences day in and day out. Google knows this and is apparently working on a pothole patrol and detection system that crowd-sources data from our collective cars as we drive down the streets. This showed up in a new patent granted to the company on August 18th of this year. 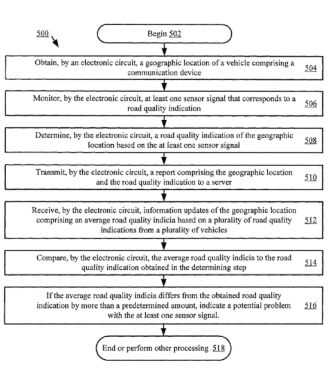 Patent 9,108,640 B2 (PDF link) covers a system based on a GPS-equipped infotainment installation with a vertical sensor somewhere inside or on the vehicle. It uses the vibrations detected by the sensor to gauge the quality of the road you're driving on and hence detect potholes and other inconsistencies. The figures above describe two different aspects of the system. 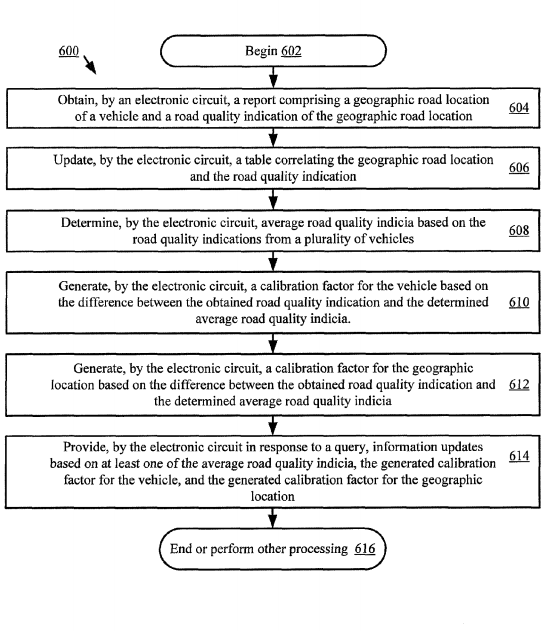 In the left one, you'll see that it will collect data from your car, send it to the servers affixed with the GPS location, and receive an average of the collected information about this same road from other cars so that it can compare results. In the right one, you can glean how this system could be applied to driverless cars: based on data collected by other cars, yours could calibrate the way it drives itself or change its routing if necessary. 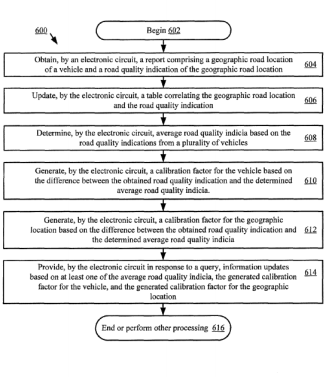 This is still a patent on paper, but it's quite cool and the technology necessary to make it work already exists in the combination of Android smartphones and Auto units. 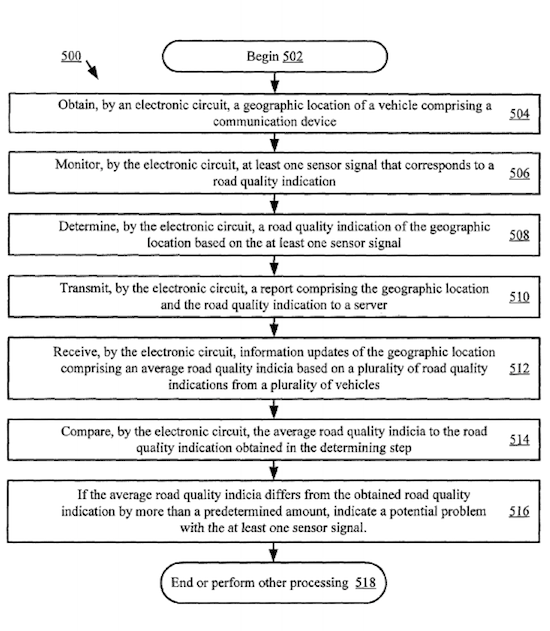 While it may be useful for us now, it will be indispensable for driverless cars: you definitely do not want to be bouncing at 100 miles per hour on a rocky road because your navigation system is following a flat map, or going nose first in a gigantic pothole because your car didn't see it.